Saturday, November 11th at Red Room Ultra Bar, 398 Richards Street, Vancouver, BC. 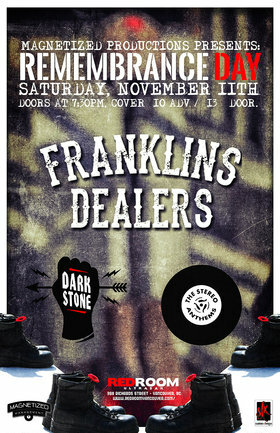 Franklins Dealers ! A guitar driven riff rock band from Vancouver,reaching back in time to create a fresh and unique classic sound. Powerhouse rock with a gritty blues edge is what makes Dark Stone a vibrant new band on the Vancouver music scene. Uniquely original, Dark Stone has managed to blend classic hard rock with metal and blues. The result is a vocal ensemble of brothers Matt Mintenko and guitarist Jason Mintenko, interspersed with searing guitar runs and thunderous rhythms from bassist Kato von Essen and drummer Stefan Grabowski. Lyrically their music speaks loudly of life's challenges, second chances, and redemption. The summer of 2014 found the band down in Hollywood CA working with veteran producer Jeff Blue who produced Linkin Park and Macy Gray. Jeff’s other credits include Korn, Limp Bizkit and Hoobastank. Dynamic & original rock with a hint of blues. You know the songs that bring great memories? Welcome to The Stereo Anthems where we rock your socks off!